Join us at restaurant Brunch for a delicious meal and then we will venture out to watch the runners as they travel through this part of the city. Be sure to take public transportation (the L) because many streets will be blocked off. Google Maps can show you the nearest transit stops. This event is open to all Bryn Mawr Alumnae and their friends and guests! Chicago area alumnae, please join us for this year’s Annual Meeting. Besides the business of our Annual Meeting, we are pleased to welcome Mr. Pelema Morrice, Bryn Mawr’s Chief Enrollment Officer. Pelema will be speaking with us about what they have learned thus far on the Admissions Listening Tour, the next steps to incorporate those learnings into planning, and an update on the class of 2019. We are meeting at the home of Barbara Morrison in Evanston. If you did not receive the evite, please contact us at bmcchicago@gmail.com so we can give you all the details. Spring Board Meeting — Sunday, March 8th @ 1PM! 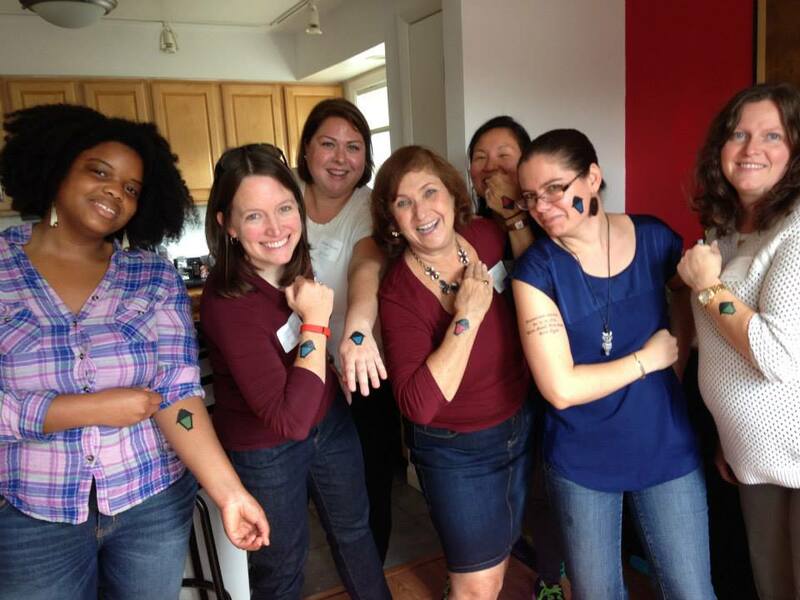 Please join us for our Spring Board Meeting on March 8th, 2015 at 1PM at the home of Amy Weiss Narea! – Review/approval of proposed amendments to the By-Laws, to reflect changes in Club functioning. The changes will be approved by the Board at this meeting and then presented for final approval at the Annual Meeting in June. – Appointment of Elections Chair to begin pulling together a proposed slate of officers for election at the Annual Meeting in June. Please see the current list of officers at https://bmcchicago.wordpress.com/board/ to see which positions will be up for election. Also please note that, due to an anticipated move, Jessica Collett’s position as Co-President will be coming open! – Planning for May Day celebration and Annual meeting — we need hosts for these events, so if you’re able and willing, please let us know! Good times at the GOLD Hell Week Happy Hour! 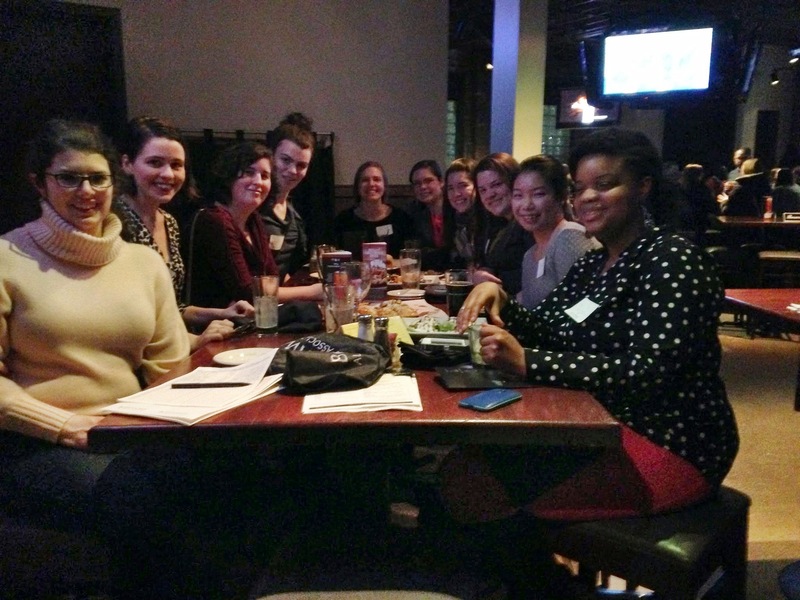 Good times were had by all at the GOLD Hell Week Happy Hour, hosted by the Alumnae Association at Rock Bottom Brewery! Chicago-area GOLD alumnae, we hope you’ll join us for our next GOLD event on April 10th, 2015, for Pilsen’s Second Friday Gallery Night! Annual Letter from the Presidents! Welcome to 2015! With a new year for the Club underway, we want to let you know what we’ve been up to and what we’ve got planned. And of course, we invite you to join us! Looking Back on 2014 — An Extremely Busy Year! We’ve had a slew of visitors from the College this year! BMC English Professor Bethany Schneider read to us from her new novel The River of No Return (written under her nom de plume Bee Ridgway). Then-Interim President of the College Kim Cassidy introduced us to the College’s exciting new 360 program classes; later in the year, we were very pleased to live-stream her Inauguration and celebrate with the College as Kim stepped up as the new President. And we heard from Wendy Greenfield, Executive Director of the Alumnae Association, as she discussed the College’s new LILAC initiative, focused on building current students’ personal and professional development. We were also very happy to be able to host a number of less formal events — an end-of-the-summer Bi-Co Picnic in Evanston, a tour of Pilsen’s Art District led by Christine Head ‘11, a new tea for alumnae in the western suburbs hosted by Karen Zatz ‘92 and Roxanne Kelsey ‘90, and of course Alice Mulberry hosted her annual Hyde Park Tea for alumnae on the south side! Our biggest event last year was a delightful Alumna Spotlight event honoring alumna par excellence Barbara Bauman Morrison ‘62. We gathered for lunch at the Avenue restaurant in Wilmette and were pleased to welcome thirty-two celebrants. This very lively crowd included not just alumnae from the Chicago area but also Barbara’s family, friends, and colleagues from her many years as a highly valued champion and proponent of the College, both nationwide and especially here in the midwest. In recognition of her passionate advocacy, upon the Club’s request the Midwest Scholarship Endowment Fund has been re-dedicated in Barbara’s honor. The Fund currently supports an award each year of about $4,500 to a student from the midwest. Capping off the event was a presentation from Ruth Lindeborg ‘80, the Secretary of the College. She not only brought greetings from the College, she also surprised Barbara with the prestigious Helen Taft Manning Award! This honor is bestowed, from time to time, to recognize a person who has given outstanding service to Bryn Mawr. Other recipients of this prestigious award include Barbara Trimble ‘60, upon her retirement as Chairman of the Board of Trustees; Elizabeth (Betty) Vermey ‘58, upon her retirement as Director of the Office of International Initiatives and having formerly served as Director of Admissions for thirty years; and the sorely missed Karen Tidmarsh ‘71, during her long tenure as Dean of the Undergraduate College, at her 35th class reunion. We are beyond pleased that the College has recognized Barbara’s rightful place as one of these great women who helped build Bryn Mawr into what it is today! We already have a number of events planned for the upcoming year, and it’s barely begun! Club events are open to all area alumnae and, while you don’t have to pay dues to attend, we sincerely hope you’ll consider doing so. Your dues are a vital support for the Club’s annual activities and help us put forth new and exciting events! You can pay dues online here. Hell Week Happy Hours – February 20, 6-8PM, Rock Bottom Brewery – GOLD alumnae, join us to celebrate Hell Week, appetizers courtesy of the College! Salon with Dr. Marcia Chatelain, Georgetown Professor – March 29, location TBD – to discuss her new book South Side Girls. “Our Collective Endeavors” – April 29, University Club – President Kim Cassidy returns to Chicago! Annual Meeting – June 13, location TBD – Pelema Morrice, Bryn Mawr’s new Chief Enrollment Officer, will discuss how best to engage alumnae/i in the shared work of attracting high achieving students. YOU hosting a Salon — tell us when and on what topic and we’ll set it up for you! As you may have heard, the Club will no longer be hosting our annual fundraising event. This change is happening at BMC alumnae clubs nationwide and allows the College to have a more direct relationship with you as a donor, so it can provide proper acknowledgement to you for your contributions. But what about the Midwest Scholarship Endowment Fund? Never fear, you can still contribute to the Fund! When donating to the College, simply note that your donation should go to the Fund by writing it on your check or, if you donate at http://brynmawr.edu/makeagift, add the Fund’s full name in the “Designate My Gift To” box. It’s that easy! Fall Board Meeting & Inauguration Event! Join us for a very quick Fall Board Meeting on September 20, 2014 at 10:30AM, to discuss upcoming plans and events for the Club. The Fall Board Meeting will be followed by the inauguration of the College’s new President, Kimberly Wright Cassidy, which will be streamed live for our viewing pleasure! Light refreshments will be served. If you did not receive the evite, you may RSVP to bmcchicago@gmail.com — and please let us know if you didn’t get the evite, so we can add you to the list! Join us after work for Pilsen’s 2nd Friday Open Gallery Night! 7:45: Head to Dusek’s (18ths and Allport) for drinks and dinner. You may RSVP via the form below or to bmcchicago@gmail.com. Please indicate in your RSVP whether you plan to join us at Dusek’s for dinner, as we will need to make a reservation. The Pilsen event is free; drinks and dinner will be dutch.